There are a number of models in the Rolex lineup that have managed to remain, somehow, relatively incognito. It is quite an achievement considering the brand’s status and global renown. Especially when the pieces concerned have been included as part of the catalog for more than half a century. It is generally the watches at the least expensive end of the spectrum that fly furthest under the radar. So, while anybody with even the slightest interest in horology would be able to name a Submariner or a Day-Date from across a crowded room, far fewer would recognize an Air-King or a standard Oyster Perpetual. The so-called entry level Rolexes, however, offer some of the best value for money in the industry, and none more so than the Rolex Date. The quality of manufacture, the attention to detail and the fastidiousness of the engineering are identical to its far better known sibling the Datejust, as well as the rest of the collection. But it comes with an intriguing little touch of anonymity over its omnipresent cousin. The one that appeals to those who are comfortable being the only ones in that particular crowded room to know they are wearing a Rolex. 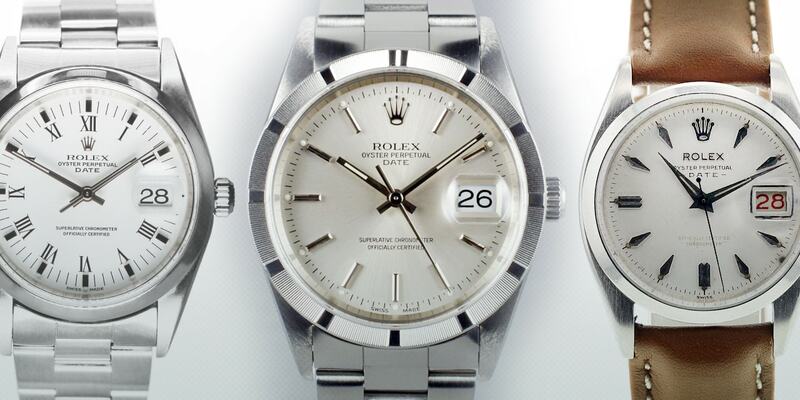 In reality, apart from losing half its name, the only differences between the Rolex Date and the Rolex Datejust are in size and the number of options in which the two are available. All of the groundbreaking innovations poured into the Datejust over the years have been adopted by the Date. This is in terms of the brand’s class-leading calibers or the quality of the metals used to forge cases and bracelets. While it is not difficult to get confused over the Date’s unique position in the overall Rolex collection, what with its confusing name, the easiest way to think about it is as a sort of halfway house between the bigger Datejust and the traditional Air-King models. The Warrior’s Watch and the men’s full size version of the Date shared case dimensions for the vast majority of their production runs; right up, in fact, to the Air-King’s latest iteration, which has grown significantly. And, like that piece, the Date is an ideal entry into Rolex ownership and can often mark the starting point of a collection. Below, we will take a detailed look at the allure of the Rolex Date for men and the different options in styling. Plus, just how much watch you can get for your money. The Date has the same pros and cons as a purchase as the other entry level watches from Rolex. Firstly, its buy-in price will most likely come as a pleasant surprise. 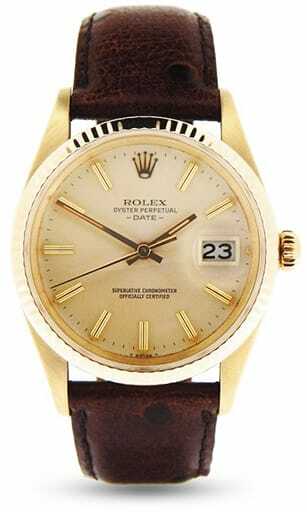 Where the average person tends to think ‘Rolex’ is just another way of saying ‘expensive’, there are several models, and especially vintage examples of lesser known watches, that qualify as extremely attainable. And the Date is most certainly one of them. Fancy a bona fide classic from the world’s leading manufacturer, a watch steeped in history and tradition that will last for several lifetimes and never go out of fashion? You are looking at the right one. 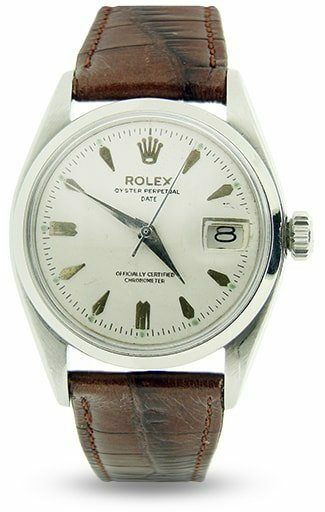 Finding a beautiful example of a traditional Rolex Date for a long way south of $3,000 is not difficult. At the very top end, there were several special editions commissioned by various establishments, such as the Royal Saudi Land Forces, that retail for more due to their rarity and provenance, but they still remain extremely reasonable. Even a brand new model fresh from the dealer is around $6,000—more than the equivalent size Oyster Perpetual, but with the addition of a date complication taking the price a little higher. The downside of all this affordability is the one that afflicts most of Rolex’s dark horses. While it is unlikely you would ever lose money on a vintage Date model, conversely they are so little known and sensibly priced that they rarely qualify as great investments. Limited edition pieces aside, the Rolex Date is not a watch for collectors. Rather, it is for those who want an unassuming, elegant timepiece—one that can match any occasion and at a size that looks just at home on male or female wrists. Perhaps the defining characteristic of the Date’s bigger brother the Datejust is the truly bewildering number of different configurations of dial, bezel, metal type and bracelet it comes in. Over the years, there have been countless different versions, all designed to make the watch the only one you would ever realistically need. The smaller Rolex Date, while never being issued with quite the same number of exhaustive options, is nevertheless not short on choice. Most commonly found in stainless steel, it has also been forged from 14k and 18k yellow gold, along with Rolex’s own proprietary mix, Rolesor. The latest six-figure reference pieces include a variant with an Oystersteel case topped by a fluted white gold bezel. It might seem obvious to say that the steel models are the most affordable, but with pre-owned Rolex, that is not always so cut and dried. With many of the big names in the brand’s stable, especially the vintage pieces, it is the steel versions that command a premium. A steel Daytona, for instance, is likely to sell for far more than a two-tone example. It is all down to their relative scarcity. When they were new, the steel watches were understandably cheaper to buy than their precious metal counterparts and sold out quicker. The shortage of steel models that generates on the pre-owned market pushed the prices of them up. So you end up paying more for the watch’s unobtainability rather than the cost of the materials it is made from. With the Date, the more expensive the metals that go into it, the more the watch is worth overall. The dials also present a vast array of different options. The color of a watch’s face is the element that is perhaps the greatest indicator of the wearer’s own personality, and the Date has enough variety to suit anyone. From the traditional colors of black, white, silver and champagne, there is a veritable rainbow of others to choose from in the model’s archives. Depending on your own particular tastes, you can take the low-key approach and opt for the understated tones of grey, blue or brown, or go full-on extrovert with one of the luridly fluorescent greens, pinks or reds that have emerged during the Date’s tenure. The hour markers, too, offer the chance to add a touch of character. With everything from the most basic baton indexes, through to both Roman and Arabic numerals, and even diamond-enhancements, there is a model out there that has everything you could want. As for the bracelets, the Date is most commonly found on the utilitarian Oyster, but there are also plenty of examples fitted with the Jubilee, the bracelet created especially for the launch of the Datejust to commemorate Rolex’s 40thanniversary. You will also see pieces on the pre-owned market wearing aftermarket bands, either on leather straps, which suit the watch’s overall styling, or with the other bracelet originally designed for one particular watch, the President. And finally, the bezel. The Date has had three different types of surround during its life—smooth, fluted or engine-turned. Of the three, only the smooth and fluted have lasted all the way through to the latest generation of the watch; the engine turned models, a technique of cutting textured grooves into the bezel, were retired across the range in the mid-2000s. Unlike the Datejust, which bowed to brand advocate pressure in 2009 with the 41mm Datejust II, and then again in 2016 when that watch was itself replaced with the more pleasingly proportioned Datejust 41, the Date has never grown beyond 34mm. It is the one essential difference between the two collections, and really the only way to tell them apart at a glance, especially with vintage models. Until the first of the recent bigger editions, the Datejust had always topped out at 36mm, once considered the perfect size for a man’s watch. The Date, with its ever so slightly reduced proportions, was made originally for men with smaller wrist sizes, a fact that has made them a particularly popular model with a younger male audience. They tend to make ideal graduation presents, for instance. It is also a size appreciated by many female wearers, with a 34mm piece and far larger now worn by more and more women as both an everyday watch as well as on special occasions. For those looking for far more feminine dimensions, a separate range of Lady-Dates was created; a tiny 26mm version made until very recently, and an especially elegant alternative. 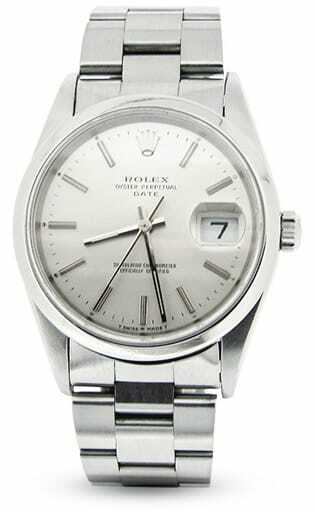 But the Date also appeared, briefly, as a mid-size, halfway between the men’s and women’s models, with a 31mm edition. It was aimed both at women wanting a slightly bigger ladies watch, and at men with particularly small wrists. The only other difference between the full size 34mm Date and the 36mm Datejust is in the bracelet width. Whereas the bigger watch sports a 20mm span between the lugs, the Date loses out by a millimeter and comes in at 19mm, all in the name of preserving those well-designed proportions. It might seem almost quaint in the modern age, but the release of the Datejust in 1945 marked a massive innovation in watchmaking. As part of Rolex’s Oyster Perpetual family, it was both waterproof and self-winding. On top of that, it also displayed the date—the first watch in the world to nail all three. That functionality, modest though it might seem now, is all present and correct inside the Date too. Behind it all, obviously, is the caliber and both watches have worked their way through several during their respective durations. For the 34mm Date, it started with the Cal. 1030. A legendary movement which debuted in 1950, it formed the base model of Rolex’s 1000 series, the brand’s first manufacture bi-directional winding mechanism. The 18,000vph chronometer certified caliber saw great service throughout the range during Rolex’s first true golden age, finding homes inside that era’s Submariner and Explorer series among others. Variations with additional complications built-in were fitted to the GMT-Master range, as well as both the Date and Datejust. As a smaller, more streamlined movement than the Aegler calibers powering the first of the Datejusts from the 40s, it meant the Date models were spared the domed case backs of the original Bubbleback watches. In the following decade, the Date received an overhaul and an all-new mechanism, this time from the 1500 series that made its debut in 1957. Regarded by some purists as the finest range of movements Rolex has ever made, they became a mainstay of the company and were still in use inside some watches until the late 80s. The Rolex Date had two different 1500 series calibers, the Cal. 1565 and Cal. 1575; both COSC-rated movements and very similar in functionality. The main differences between the pair were in frequency speed (18,000vph for the 1565, 19,800vph for the 1575) and the fact the latter model eventually gained a hacking function around 1972, allowing greater accuracy when setting the time by stopping the seconds hand when the crown was pulled out. Like its predecessor, the 1500 calibers powered some of the biggest names in the brand’s lineup, and the engines that drove the Date also ran models such as the Explorer II, GMT-Master, the Submariner (which got its own date function in 1969) as well as the Sub’s big brother unveiled two years before, the iconic ref. 1665 Double Red Sea-Dweller. Interestingly, if you were to open up the back of many of these 1565 or 1575-run machines, you would most likely see the winding bridge stamped with 1560 or 1570, the respective time-only base movements. It is the second 5 in the caliber’s reference number that designates them as date models, but as the winding bridges were interchangeable, many were used by Rolex in watches with the additional complication for convenience. It wasn’t actually until the next upgrade that either the Date or the Datejust received their first calibers with a Quickset function. The previous series of movements had pioneered the cam and jewel system that produced an instantaneous date change at the stroke of midnight (‘just in time’—‘Datejust’) but the wearer still had to wind the hour hand through a complete 24-hour cycle to advance the date. When the Cal. 3035 started work in 1977, it brought with it the ability to change the date independently via the crown in the second position. It was also the movement that ushered in the high beat 28,800vph frequency that produces Rolex’s famously sweeping seconds hand, and gives their watches even greater levels of accuracy and resilience. Today, the full size Rolex Date is run by the Cal. 3135, arguably the Swiss giant’s most successful and widely-used movement, introduced in 1988. Along with the Quickset feature and hacking function, it is also at the leading edge of caliber technology, with its Glucydur balance wheel, an alloy of beryllium and copper, and the brand’s patented Parachrom bleu hairspring, said to be completely antimagnetic and 10 times more resistant to shocks. The Date is certainly not the most complicated model you can buy, in terms of functionality. What it is though, is the end result of more than 60 years of constant efforts to make it the best at what it does, and you will rarely find another watch that can compete with it for sheer effortless timekeeping. As the more stealthy of the two, the Date was made in fewer numbers than the Datejust, but there is still a very healthy pre-owned market grown up around the watch. Obviously some iterations are rarer than others but, curiously, unlike many of Rolex’s vintage models, the earliest reference is not necessarily the most valuable or sought after. Although short in supply, the ref. 6534 can still be had for a surprisingly small outlay—all original parts and, if you’re lucky, some attractive dial patina thrown in for good measure. You will find this inaugural model of the 34mm Date at a fraction of the cost of the first Datejust in the series, and also cheaper than a DJ released in the same era. As we said, the Date is not the first thought of many Rolex collectors when they come to pick their next acquisition. At least, not yet. However, there is nothing to say that won’t change in the next few years, especially with the first signs of the race to create the biggest, most oversize watches starting to tail off. This year’s Baselworld showcased a host of models that took a step back in dimensions, and the event has long been a foretaste of things to come. The modest 34mm proportions of the Rolex Date could well be en vogue pretty soon. There are the occasional outliers that will resale for far more than the standard issue pieces, no matter what precious metal they are made from or how many diamond indexes they have. Limited edition examples of the Date do exist, and they can be culturally fascinating. During the 60s and 70s, Rolex wasn’t averse to co-branding their watches with various organizations, usually as rewards to loyal employees or as gifts for executives, a practice it has since seemed to have done away with. These alliances were formed with everything from Middle Eastern royal families to pizza restaurants, with the infamous Domino’s Pizza Air-King. Similarly, the Date has several extremely rare privately labeled examples you might just find on the pre-owned market, and they offer a real sense of exclusivity. The ref. 1500 from the 1960s, for example, had a special edition made for the United Arab Emirates military, with the force’s emblem on the dial. Although definitely offered at a premium, even these especially scarce examples are still relatively attainable. One co-branded piece you almost certainly will never find is the Mickey Mouse Rolex Date. Not to be confused with the redialed aftermarket Frankenwatches that appear for sale quite frequently, no one even seems 100 per cent sure there ever was an official collaboration between Rolex and Disney Corp, and you will be hard pressed to find anyone who has so much as seen the real thing, let alone owned one. There is a vague rumor that, much like the Albino GMT-Masters at Pan-Am, the Mickey Mouse Date was created for Disney’s board of directors. But if you are ever offered one for sale at an extortionate price, some in depth research is in order. Or just run for the hills! The Rolex Date has a timeline that runs more or less parallel with the Datejust, the two sharing the same progressions in technology and tweaks to the design. But in later years, the Date has started to lag behind its larger cousin with its updates. Even today, the current model still uses the Cal. 3135, while the latest Datejust is driven by the more modern Cal. 3235. If the pattern of the last decade or so continues, expect the contemporary 34mm Date model to get the new caliber any day now. 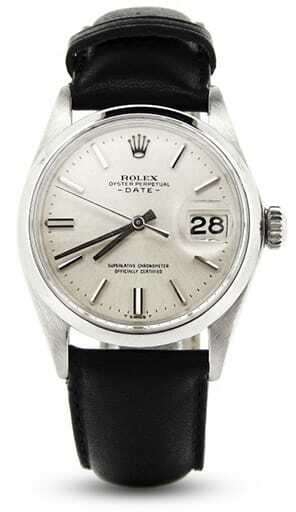 It all started in the 50s when Rolex brought out the ref. 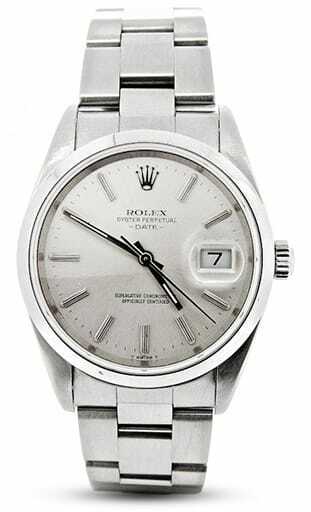 6534, almost a crossover offering, with the dimensions of the Air-King and the functionality of the Datejust, both of which had been in service since 1945. A low-key success in the age of icons such as the new Submariner, GMT-Master, Day-Date and Milgauss, the Date provided a nice middle ground for those who found those models a bit on the large side. That inaugural reference was followed up in the early 60s with the long-running 1500 series, graduating to a more modern caliber in the Cal. 1565 and later the Cal. 1575. There are several different editions in the series, among them the ref. 1500, a stainless steel piece with a smooth bezel. The ref. 1501 is also steel but with an engine turned surround. The ref. 1503 and 1507 are in 14k and 18k gold respectively and the ref. 1505 came in Rolex’s half and half Rolesor mix. A similar variety was available in the 26mm Lady-Date range, with the separate ref. 65XX family appearing in the late 50s. The end of the 70s is when the first gaps started to appear between the Date and the Datejust. While the DJ received its new high beat, Quickset Cal. 3035 in 1977, the Date had to wait until 1983 to be outfitted with all that convenience. The five-digit reference models, the 152XX series, carried over the same options as the preceding family. The ref. 15200 was the steel case/smooth bezel piece, the ref. 15210 had the engine turned bezel, etc. The inclusion of the Quickset made the 152XX range more costly than previous models, and that remains true on the pre-owned market. And finally, the contemporary six-digit series, with the Cal. 3135 (Parachrom hairspring et al) has been stripped back to just a small handful of models. The 34mm watch now appears on Rolex’s website very much as part of the Datejust line, and on both the men’s and women’s pages. You will find examples in Oystersteel (Rolex’s rebranding of 904L steel) as well as steel pieces with fluted, white gold bezels. There are a range of dial colors available and even some with diamond hour markers. 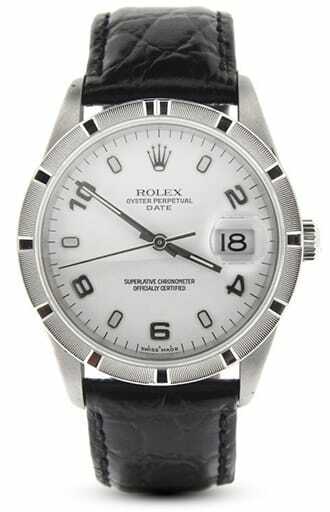 The Rolex Date has spent its considerable production run as the understudy to the all-conquering Datejust. A watch that found itself sized out of overwhelming popularity, its 34mm shell has since become as admired with women as it once was with men. But with the cyclical nature of fashion trends, it could well find its more modest proportions are overdue for a mini renaissance.